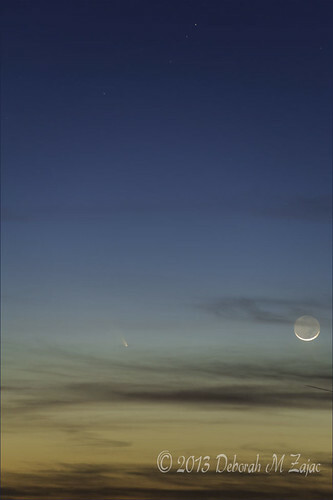 Comet- PanStarrs, originally uploaded by dmzajac2004-. Tonight a friend and I went out to try and photograph PanStarrs the Comet that is passing through our hemisphere right now. I couldn’t see it with my naked eyes until the last few minutes I was shooting. Prior to that I was shooting on faith that I had it in my frame. When I thought I had I was so excited, but I really was happy when I got my frames uploaded and saw it. We have another chance to see it tomorrow night as viewing promises to be good as well. Discovered in June 2011, comet 2011 L4 (PANSTARRS) bears the name of the telescopic survey that discovered it — the less than mellifluous sounding "Panoramic Survey Telescope and Rapid Response System" which sits atop the Haleakala volcano in Hawaii.